Agents and administrators can delete users. Administrators can also permanently delete users, which goes a step further in terms of removing a user from the system. You might sometimes need to permanently delete users because of General Data Protection Regulation (GDPR), which is an EU regulation. For more information, see Complying with the GDPR in the cross-product Help Center. Deleting users from your account soft deletes them, meaning the users are still in the Zendesk database and accessible on a limited basis only to Zendesk employees with certain database privileges. You have the option of permanently deleting these users. Both agents and administrators can soft delete end users or agents in the agent interface in Zendesk Support. Agents can delete end users, if they have permission, while administrators can delete all users except the account owner. Zendesk retains information about the account owner to continue providing its services. When the account is terminated, Zendesk follows its Data Deletion Policy to purge remaining profile data. Agents must have permission to delete users. On Essential, Team, or Professional, permission is provided by default based on the Agent role. Also, agents cannot delete users unless they have Access > All tickets set in their agent profile. On Enterprise, edit a custom agent role, scroll to What access does this agent have to end-user profiles, then select Add, edit, and delete all. You can't delete an end user or agent who's a requester on a ticket that hasn't been closed yet. See What is the difference between a Solved ticket and a Closed ticket? First, the ticket must be solved before it can be closed. Second, the solved ticket must be closed by a trigger or an automation. The ticket can't be closed directly in the agent interface. 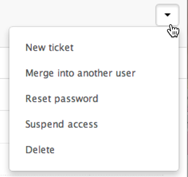 To close the ticket immediately, you can create a trigger for the specific purpose of closing the ticket. For details, see the tech note How can I manually close a ticket?. If the deleted user was the requester or assignee on a closed ticket, you can still find the closed ticket by searching the ID. If you try to access the deleted user's profile from the ticket, you will receive an error. Note: Deleting a user's account cannot be undone, so be careful to select the correct user when deleting user accounts. Click the Admin > Manage > People, and search for the user. Click the user's profile from a ticket submitted by that user. In the user's profile, click the User options arrow in the upper right, then select Delete. When prompted, click OK to confirm the deletion. If you want to cancel the deletion, click Cancel instead. If your organization must adhere to General Data Protection Regulation (GDPR) and the user wants to be forgotten, permanently delete the user as described in the next section. If your organization must adhere to General Data Protection Regulation (GDPR) and the user wants to be forgotten, after you delete personal data from all resources in Zendesk products, you must also permanently delete the end user or agent from Zendesk Support. Permanently deleting the user in Support also permanently deletes the user in Guide, Chat (for agents), Message, Talk, and Explore. The user is also permanently deleted from Insights and from all product reports. You should permanently delete a user only as the last step in the process of deleting all the user's personal data to comply with GDPR. The order of the tasks is important because you need the user's profile data to find their personal data in tickets and in other resources. If you permanently delete the user first, finding their personal data will be more difficult. For details, see Forgetting a user in Zendesk in the cross-product Help Center. You can't permanently delete the user unless you soft delete them first. Only administrators can permanently delete an end user or agent. It may take some time for the system to permanently delete users depending on the amount of data currently queued for deletion. However, it should take no longer than 30 days. Delete a user as described in the previous section. Click the Admin icon ( ), select Manage > People, then click Deleted users in the sidebar on the right side. A list of deleted users appears. Select the user you want to permanently delete from the list. A screen appears with the user's name and their associated tickets. If your organization must adhere to General Data Protection Regulation (GDPR) you have to permanently delete users older than 2 years. How can you bulk permanently delete? But it links to the end points for "normal" deletion not permanent. Can you please email your question to privacy@zendesk.com? Normally we wouldn't ask you to switch channels, but since GDPR is a legal compliance issue, the legal team has restricted what we can say about GDPR-related issues in the community and asked that we send all related questions over to them. this list with deleted users is neither searchable nor sortable, and users are listed only based on when they were deleted. The usability is very very low; it is impossible to find the correct user to permanently delete her if I have a long list of deleted users? Please advise! Thank you very much. Now, I have agents who left my company some time ago, and must be permanently deleted. I do not know when they were deleted, and I have no way of finding out, unless I click through each and every page. Is this the only solution? And, one more question; how long after permanently deleting an agent, can I expect the name to be scrubbed from the tickets? I have just now soft deleted, and then permanently deleted an agent, but her name still shows for the comments she has made. (I realise her name will not disappear from the public comments or internal notes, but I do expect it to disappear from the "title" of all comments she has made, replacing it with "Permanently deleted User" or similar. Correct...? Thanks. Sorry, but that's a really convoluted process to get a customer deleted. We are an online business. If a customer asks to be permanently deleted then a year later they email us for a quote from the email address that has been deleted what will happen? If you've fully permanently deleted them from the system and they email a year later, it would treat them as a new user and would set up a new account for them. "The user is soft deleted, meaning the user is still in the Zendesk database and accessible on a limited basis only to Zendesk employees with certain database privileges." If a user is "soft deleted" as mentioned above, what is the process of getting the user restored or reinstated? Unfortunately it is not possible to recover a soft-deleted user. Additionally, we are unable to recover the organization or user on your behalf in accordance with our Data Recovery Policy. It appears that not all users are hard-deleted so that closed tickets in the account will retain a property called Ticket Requester, which stores the ID of the requester even after deletion. This can be used in Insights to review the data, or when reading the ticket via API. Deleting a user removes their profile completely, but their tickets and Help Center posts (community/created topics) will remain. Do those remaining posts/tickets somehow have an indication that they belong to a deleted user? There is no indication on community posts or help center portal but you will see the indication when you view user's profile and tickets within your zendesk instance. How do I cancel my Zendesk Chat subscription?